Las Vegas with its harsh desert terrain doesn’t seem a fertile enough place to be the breeding ground of anything much, but when translated from its Latinate origins ‘Las Vegas’ transposes to become ‘The Meadows’. It was these meadows that spawned the always colorful and oftentimes confusing city of Sin that holds itself up, a bastion in the center of the barrenness that surrounds it. 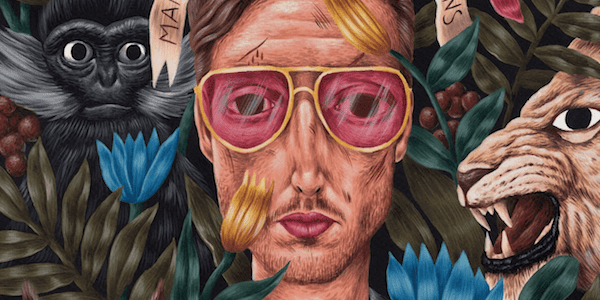 It goes without saying then that as a by-product of this miraculous appearance of life in the most unlikely of places, musician Mark Stoermer has always been up against the odds and has an inherent knack of beating them too. Without many local heroes to aspire to, Stoermer looked back in time and to the British Isles for inspiration and it came in droves. From The Beatles and Led Zeppelin to Pink Floyd’s Syd Barrett and the inimitable Bowie, music became a way for Stoermer to escape the hustle of the Strip, leading to him holing himself up in a murky garage to write songs instead of frequenting the ever-glittering clubs and casinos. It was this love of music that brought about a catalyst that set in motion a chain of events that is still going on today. After joining a then little-known local band called The Killers who catapulted to stardom in the mid- 2000s, Stoermer went on to produce Aussie foursome Howling Bells’ third album; toured with The Smashing Pumpkins as bass player; and wrote, produced and released three solo albums— the first of which, Another Life, was released in 2011; the second, Dark Arts, in August 2016; and the latest, Filthy Apes and Lions, in November 2017. The inspiration for his LP3 came at the end of Dark Arts, while writing the song “Blood and Guts.” This opened new doors for him lyrically and conceptually, bringing him into the territory of psychedelic rock-opera. One album rolled into the next. Surrounding himself with producers/ friends/engineers David Hopkins and Robert Root (the same team he had enlisted for his LP2), Stoermer envisioned his own story of a surrealistic apocalyptic fantasy based in a zoo. This gave birth to the title track of the album. Off and on, from late 2016 to spring of 2017, it took roughly 6 weeks in the studio to write, record, and produce the album. This was accomplished while Stoermer was simultaneously writing and recording for The Killers’ LP5, released in September 2017. Stoermer increasingly takes risks from album to album, while capturing more of a feeling of “letting go.” Projecting more of a sense of enjoyment in the process of song writing itself, Filthy Apes and Lions is a departure from Dark Arts, yet at the same time, a natural extension of it.